Current location: Van Gogh Museum, Amsterdam, Vincent van Gogh Foundation. Vincent van Gogh* began experimenting with color in his still life flower series. By the summer of 1885, the artist created some 40 paintings with a traditional approach, meaning that the flowers were in a vase and placed in the center of the canvas. 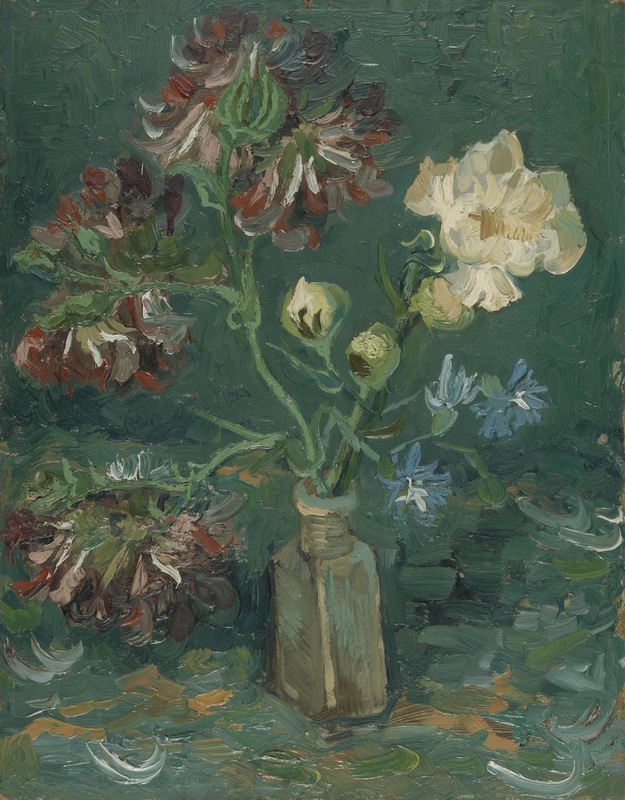 His 1886 painting Small Bottle with Peonies and Blue Delphiniums, done with oil on painter's board -a cheaper material than canvas-, from the Gemeente Museum collection, is one of them. Flowers became the subject of many of the artist's works during this period. But after painting over 10 species in mid-September, he sought out other subjects including fruit, shoes, fish and budding flower bulbs.